Having a shuffleboard in your bar adds excitement to the room, giving patrons something to congregate around with excitement. Shuffleboard tables can help fill the room so you’ll want to think about this things when deciding where to place a table in your sports bar or pub. If you have any questions, contact a shuffleboard expert from Shuffleboard.net by calling 1-888-440-6988. Space is the most important factor when placing your shuffleboard. There should be at least 2’ of clearance on either side of the table, with 3’ of space on each end for players to stand. A long, very narrow space may not work for shuffleboard if there is no room for players to stand or spectators to watch! Players need enough space to move around the table easily. You can read this article for more detailed recommendations and learn how much space you need for a shuffleboard table. A shuffleboard table takes up less playing space than billiards. 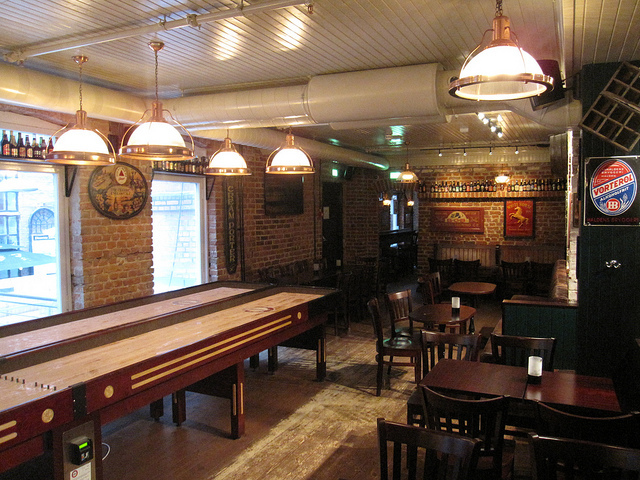 This makes shuffleboards great for crowded bars, or bars with lots of seating. However, placing the table in the middle of a large, open room is not ideal either. Too much open space means that the table may be too crowded by guests, during busy hours, for anyone to play. Your other guests may find the table cumbersome as well. The table needs to be properly sized for your space. Commercial shuffleboards are available in lengths from 9’-22’. A longer table provides more challenge, but a shorter table takes up less space and is more inviting to new players. When measuring to buy a shuffleboard table, be sure to measure doorway height and width to avoid any delivery disasters. Any additional features, such as a scoreboard or lights, can add height to the table. The height of the table does not matter, in relation to your space. As long as there is enough space for players to move freely, you can place a shuffleboard table virtually anywhere you have the space for it. For help deciding what size table you should purchase, you can read this article aptly titled, What Size Shuffleboard Table Should I get. While an unused room or dusty corner may seem like the perfect place for a shuffleboard, a new shuffleboard may not generate new income if the table is unappealing or hidden. Putting a shuffleboard in a previously unpopular area means the table will not generate the traffic you are hoping for. Do not place the table behind a door or in a difficult location. Let guests know about the table by adding lighting, moving seating, and perhaps organizing a mini-tournament. Show your guests how excited you are for the new table and they will be encouraged to play. Make use of your space by moving other game tables you may have to let the new shuffleboard be the highlight of your bar. Everyone should know about the new table, as soon as they walk into the door. Place the shuffleboard within sight of popular features to pique guest interest. Finding the perfect shuffleboard table is easy with the help of our experts at Shuffleboard.net. See our full catalog for the best prices on shuffleboard tables and accessories for outfitting your bar. This entry was posted in Game Rooms by admin. Bookmark the permalink.